In-ear monitors (IEMs) are devices used by musicians, audio engineers and audiophiles to listen to music or to hear a personal mix of vocals and stage instrumentation for live performance or recording studio mixing. They are often custom fitted for an individual's ears to provide comfort and a high level of noise reduction from ambient surroundings. Their origins as a tool in live music performance can be traced back to the mid 1980's. A monitoring system is any system that provides a mix of audio sources to a performer on stage. Traditionally, monitors were loudspeakers placed on stage directed toward the performer (often called floor monitor speakers or wedges). Depending on the sophistication of the audio system, floor wedge speakers can have disadvantages. First, floor wedges greatly increase the onstage volume, in some cases to potential hearing damage levels. Second, while floor wedges can be placed in front of a particular singer, guitarist, bassist or drummer, the other musicians can often hear the other musicians' wedge mixes. In a sophisticated monitoring system, every band member can have their own monitor mix, which is their particular preference of vocals and/or instruments. Since performers wear an IEM in each ear, they can also hear a stereo mix if a particular monitor system allows it. This can allow additional definition of the audio by panning different elements (vocals, drums, etc.) to each ear. Recent advances in this technology also allow the user to incorporate an ambient feature, allowing them to adjust the amount of ambient noise filtered by the IEM. One additional consideration for mixing IEMs is that while getting rid of floor wedges can improve the overall clarity of the mix for the performers and decrease the overall volume onstage, one important piece that is often lost is crowd noise and crowd comments, such as the audience calling for an "encore". It is not uncommon for a microphone to be placed near each side of the stage, facing out to the audience, to provide a way to get some of the crowd noise and audience comments back into the performers' IEM mixes. Larger live shows could have several microphones for this purpose spread across the front of the stage, which could also be sent to a multitrack recording device used in an outside broadcast production truck, or other destinations. The most common professional stage in-ear monitor system employs the use of a wireless system to send the mix to the IEMs. 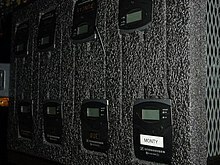 This system contains a transmitter and a receiver pack about the size of a pack of cards that is worn by the performer. There is generally a transmitter for each monitor mix and there is always a receiver for each IEM. The transmitters usually output either one stereo mix or two mono mixes. When the transmitters are set up for two mono mixes, one transmitter can be used for two different mixes. Any number of receivers can receive a single mix. The transmitters and receivers transfer audio wirelessly via a VHF or UHF radio frequency. Generally speaking, UHF systems sound much better than VHF systems and are also more expensive. UHF systems usually are less susceptible to frequency interference which adds to their level of quality. The in-ear monitors themselves are the last stage of the signal path in the system. The IEMs are often custom molded and, therefore, are comfortable to wear and allow the sound to be sent directly into the user’s ear canal. They also provide a better seal, though it is able to isolate only ambient noise, thus resulting in a lower level of ambient noise heard. Depending on the quality of the fit and length of the canal portion of the earpiece, a custom fit in-ear monitor will generally provide somewhere between 25 and 34 decibels of noise reduction. This means that loud onstage instruments, such as drum kit or large 8x10" guitar stacks, are less likely to cause hearing damage for onstage musicians wearing IEMs. Custom in-ear monitors come in a variety of colors but are usually clear or a color that closely matches the skin color of the performer. Some manufacturers can also place custom artwork directly on to the custom in-ear monitors. The IEM cable plugs into a 3.5 mm stereo jack on the receiver pack; typically clipped onto the belt, guitar strap, clothing of the performer, or placed in a pocket. Non-custom (universal) IEMs are also available and typically include a variety of foam and silicone tips in each pack, so that at least one pair may create a comfortable seal for most people's ears. If a non-custom IEM earpieces do not fit for a specific person, they may need to order custom IEMs. If there is not a seal, the ambient noise leakage increases, and as such, the IEM is not as effective. Television studios use earpieces with a specialized type of intercom called an interruptible feedback (IFB), as a means of communication. Originally invented for hearing aids, balanced armature drivers are nowadays used extensively in modern in-ear monitors. In-ear monitors can function with as little as one armature driver but some of the top models of in-ear monitors can carry as many as 18 balanced armature drivers for faster response, higher dynamic range, and more detailed sound. Notable examples include JH Audio’s Layla (12 balanced armature drivers), Noble Audio's K10U (10 balanced armature drivers), and 64 Audio's A18t (18 balanced armature drivers). The dynamic driver contains a diaphragm with a voice coil attached to it. When an electric current passes through, the voice coil vibrates between the two permanent magnets resulting in the diaphragm moving and producing sound. Adherents of the dynamic driver cite better bass response. ^ "UHF vs VHF Wireless". Retrieved 22 April 2015. ^ "House of Worship Sound Reinforcement". Mark Lee. 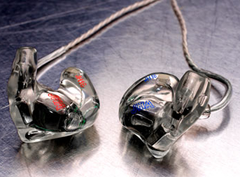 ^ "In-Ear Monitors — Balanced Armature Drivers vs. Dynamic Drivers". 441K. 2014-02-24. Retrieved 2017-10-01. ^ "What IS a Balanced Armature Driver?". jhaudioblog. 2012-09-26. Retrieved 2017-10-01. ^ "Balanced Armature Driver vs Dynamic Driver, What's The Real Difference? | Major HiFi". Major HiFi. 2017-08-16. Retrieved 2017-10-01. 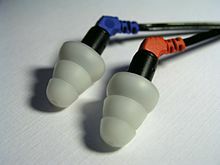 Wikimedia Commons has media related to In-ear monitors. Burton, Jon (February 2013). "An Introduction To In-ear Monitoring". Sound on Sound. Cambridge, UK: SOS Publications Group. Archived from the original on June 17, 2016. Retrieved April 4, 2019. "Musicians' Hearing Center: When is Hearing Protection Needed?". University of Pittsburgh Medical Center. Archived from the original on December 15, 2006.